Cheddar Chive Biscuits are garlicky and cheesy with a strong, savory flavor. They're perfect for sopping up gravy. Gravy is one of those magical texture changers out there, it's never the framework for the dish, it's what brings it together or sometimes even saves it. Joey Tribbiani said it perfectly when he described a gravy layer in a sandwich as "the moist-maker." Everyone loves it and it's easy to make, provided you have been saving your bacon drippings. If you don't save them, you should start. Here are some great reasons why from one of my favorite resources, the Kitchn. So why tomato gravy? Why not? 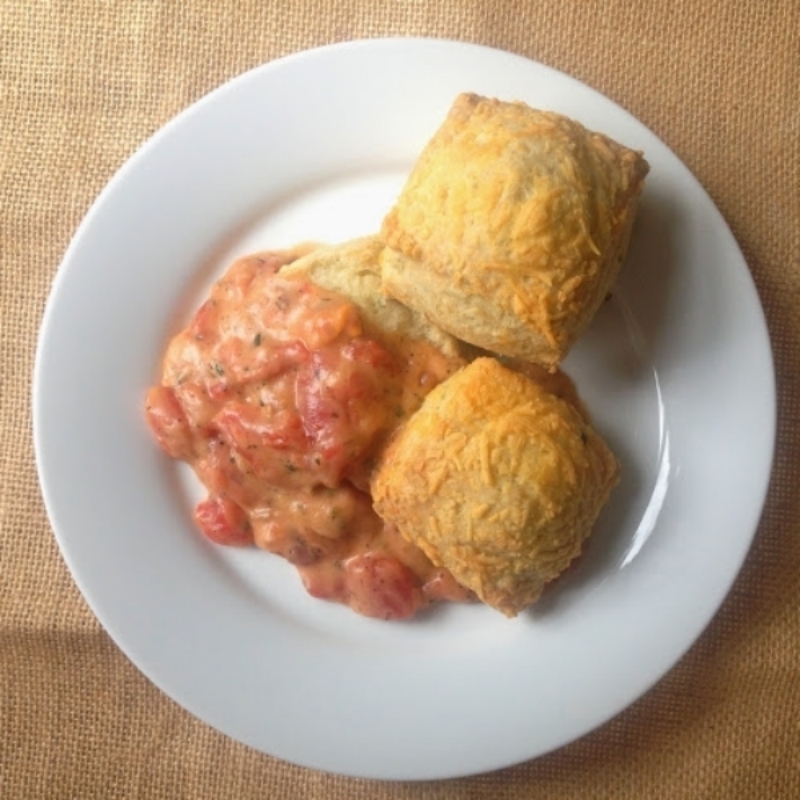 I thought the tomatoes would add a mild, sweet flavor that wouldn't compete with the biscuits. I liked the idea of using up some herbs from my garden (you could easily use dried if you don't fresh herbs available). I had half an onion to use up and there's always those bacon drippings on the back shelf of the fridge. Really, that's it. I had everything I needed on hand and I really felt like sopping up gravy with a biscuit. Gravy doesn't have to be a special thing with a lot of fanfare, that's not its job. Preheat your oven to 350 degrees. Place biscuits on a baking sheet lined with parchment paper and bake for 25 minutes or until centers are cooked through. While biscuits are baking, warm up bacon drippings and butter in pan over medium heat. Add onion and let sizzle for 6 minutes. Then sprinkle flour over the onion and fat and cook, stirring constantly, for about 3 minutes. Add tomato, herbs, salt and pepper. Cook, stirring often, for about 3 minutes. Add milk, and bring to a light boil; reduce heat to a simmer, and cook, stirring often, for 2 minutes to thicken gravy (if gravy becomes too thick, add more milk for desired consistency). Split biscuits while warm and top with gravy. Enjoy! 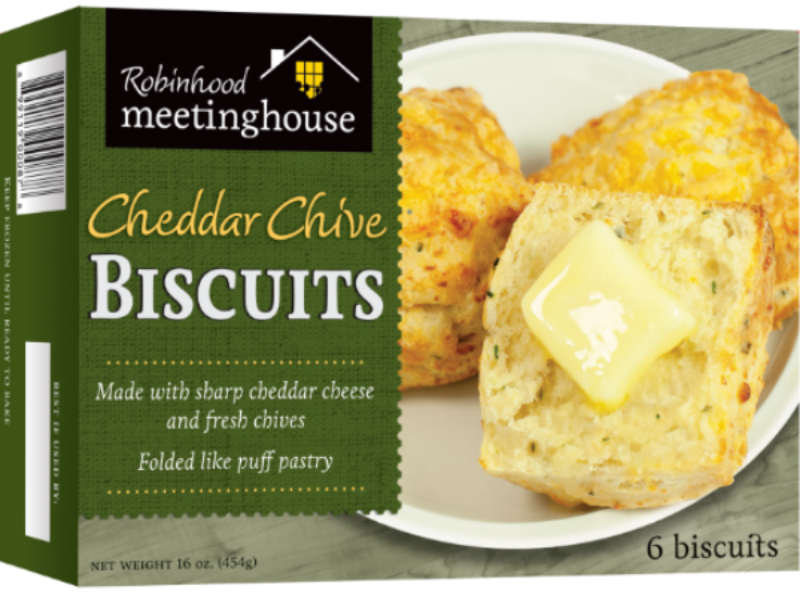 A note: Cheddar Chive Biscuits are a very new product without any stores carrying them yet. BUT - you can win some on our Facebook page until Monday 5/5 for Mother's Day and if you order 4 dozen or more biscuits (any flavors) on the Robinhood Meetinghouse website the shipping is free until Weds 5/7! So, if you're intrigued and want to try them first, now is the time!